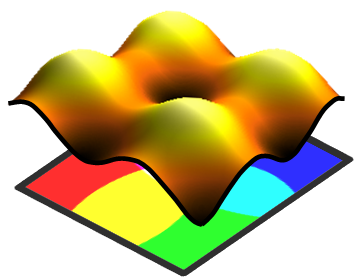 Mountains® allows you to analyze simple but also composite data obtained using a very wide range of surface analysis instruments & microscopes. The following are some of the most common data types managed. Topography and images from profilometers, optical profilers, microscopes etc. Profile z=f(x) A profile is a measurement of heights along a line on a surface. The height Z is expressed according to a position X. Series of profiles z=f(x,t) Several profiles packed together as a single data set. Roughness or waviness parameters calculated on several profiles scanned at different positions or in different directions in order to increase the stability of parameter values. Automotive: control of “orange peel” defect on painted body parts. Parametric profile (“contour”) (x,z) = f(t) The outer line of one or several objects. Contrary to the standard profile (in which only one side is studied), a parametric profile may contain overhangs and closed contours. Surface z=f(x,y) A surface is a measurement of heights over a rectangular area of a surface. The height Z is expressed according to a position X,Y. Series of Surfaces z=f(x,y,t) Several surfaces packed together as a single data set. Wear: successive stages of a surface being worn, calculation of the missing volume (3D). Electronic packaging: study of chip carrier distortion when applying a heating cycle. The result can then be studied as a surface-image data type (see below). Mountains® 3D-reconstruction of Scanning Electron Microscopy images (2D images) will supply images in 3D of this type. Usually the result of applying a threshold to a gray level image or to a surface, in order to isolate objects from a background. Force Curve Force Curves represent the deflection of the cantilever (used in Atomic Force Microscopy, AFM) according to its vertical distance from the sample. The measurement consists of two curves, the approach curve (blue) and the retract curve (red). Force-Volume A Force-Volume Studiable is a grid of equally spaced Force Curves. Each point in the image corresponds to a force curve that contains an approach and a retract curve. A Force Volume Studiable is a set of Force Curves that is considered as a single object. Mountains® offers advanced tools analyzing hyperspectral data, such as blind unmixing functions allowing dissociation of the original spectra from an image. Hyperspectral cube In a hyperspectral cube, each pixel in the image represents a full spectrum. The color of the pixel in a slice gives information about the intensity or amplitude of the spectrum at the given wavenumber. What if my instrument data type is not listed above? The above list contains data types available in currently released versions of Mountains®. However other data types, already developed in the frame of private projects or for future versions, may also be managed. Please contact us.